During her Presidency, Rashtrapati Bhavan played host to many individual achievers and also organizations working for the removal of various social ills and evils existing in our society. The Presidency of Smt. Patil was known for her ceaseless crusade against those social practices and age-old traditions that had created inequality in status between a man and a woman in society. She believed in equal participation of men and women for broad-based and balanced socio-economic development. She addressed people saying that ‘Men and women are two wheels of a chariot. If one wheel is weak then the chariot finds it difficult to progress; so will the family, society and the nation. If the chariot has to move smoothly and progress in the right direction both the wheels have to be equal and should move together in perfect harmony’. She reiterated in her speeches and interactions with the youth of the country, that it is the ‘mindset’ of the people that is responsible for perpetuating the system of inequality in society, and in creating a deep-rooted bias against a girl child. Smt. 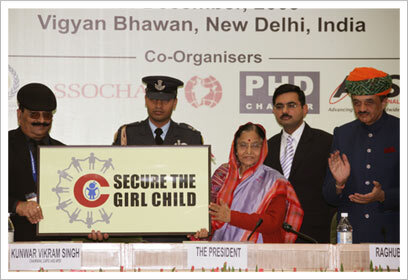 Pratibha Patil addressed a huge gathering of men and women at a seminar on empowering women and save the girl child, organized by the Nanhi Chhaan, an organization campaigning for ensuring rights of a girl, at Amritsar in Punjab on October 6, 2009, and made an impassioned plea to save girls. In a solemn function at Rashtrapati Bhavan on International Women’s Day, on March 8, 2009, she administered a pledge to save the girl child, to a gathering of eminent people including social activists. It was a pledge ‘to work tirelessly against the inhuman practice of female feticide; a pledge to motivate people to reject social bias; and a lifelong commitment to work for the cause of the welfare of the girl child’. Smt. Pratibha Patil never missed an opportunity to applaud the achievements of girls, be it a convocation ceremony or a seminar or a public meeting. On September 8, 2007 i.e. International Literacy Day, the first of her Presidency, she said, ‘Women continue to face the challenge of breaking through the glass ceiling but they have made some inroads and have proved to be highly successful professionals in varied fields such as astronauts, doctors, lawyers, bankers, entrepreneurs, etc.’. She always took note of the higher number of medal winning girl students, in comparison to boys in different functions at universities and colleges, and made it a point to encourage them to attain new heights in their professional career. As early as in February 2008, Smt. Pratibha Patil decided to have detailed discussions on different schemes for gender equality so as to bring about convergence. She emphasized that effective convergence of schemes run by various departments and ministries at the grassroots level was the only way to avoid duplication of efforts, and to ensure greater impact on stakeholders. These discussions resulted in the formation of a Committee of Secretaries for convergence and coordination of government programmes for gender equality and fighting social evils, and also Task Forces by the concerned Ministries for better implementation of schemes for target groups. The experience of Smt. Pratibha Patil as a Minister in Maharashtra at the time of drought in the Vidarbha region was an eye opener for her. Despite the infusion of funds through various poverty alleviation programs of the Government of India, the outcome audit of the Collector, Amravati, for which she was the Guardian Minister, revealed that the schemes made no positive impact on the quality of life of poor laborers in the region. The funds received under such schemes were mostly squandered away by the beneficiaries on consumption of liquor and gambling and had a deleterious effect on their health and family life. Smt. Pratibha Patil was convinced that economic empowerment is not the panacea for all round development of society, and resolved to fight against alcoholism, and promote the causes of de-addiction. Lakshmi Nanda, a resident of Alwar in Rajasthan when she received a “priceless” Rs. 500 from Smt. 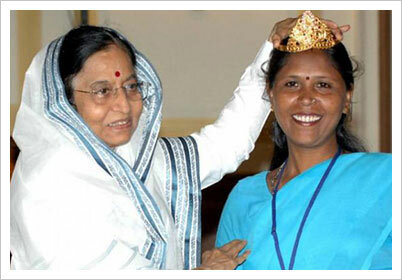 Pratibha Patil as a reward for reciting a poem she had written. The 27-year-old Nanda recited a poem ‘Patan se Udhan ki Taraf’ (from fall to freedom) in which she emphasized on the upliftment of a woman scavenger that fascinated Smt. Pratibha Patil and she immediately handed over a Rs. 500 to Nanda as a prize. In reply to this Nanda said, “It’s a proud moment for me. I am so touched by the gesture. This currency note is priceless for me and I am not going to spend it”. That time Smt. Pratibha Patil assured the group that the centuries-old manual scavenging practice would soon be abolished in the country and said she would take up the matter of ending the practice with the government. The group of more than 30 women scavengers, led by chairman of Sulabh International Bindeshwar Pathak then participate in a cultural programme in the United States and also met important personalities. Smt. Pratibha Patil expressed great concern over the rising incidents of ragging in educational institutions across the country. On various occasions, she exhorted universities and colleges to prevent students from resorting to acts of violence and torture in the name of ragging. She urged State Governments to consider formulating appropriate legislations for a credible deterrence. She called upon Governors and Lieutenant Governors to use their good offices in eliminating the menace of ragging from the educational institutions in their States and Union Territories, and also to consider enacting appropriate legislations, if it does not exist in their States and Union Territories, for a credible architecture of legal deterrence. Smt. Pratibha Patil also said that the cooperation of NGOs active in this field should also be enlisted in creating a climate of awareness. Governors and Lieutenant Governors, in turn, sent Actions Taken Reports. The measures taken to tackle the issue includes forming of Anti-ragging Committees and Squads, State Level Monitoring Committees with a Governor as its Chairman, and holding meetings with Vice Chancellors (VCs) of Universities falling under their jurisdiction. In an appeal to people of the country on April 14, 2009, Smt. 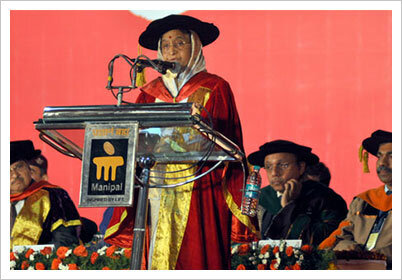 Pratibha Patil urged students, especially senior students to be more responsible and make their juniors feel at home in their new educational environment. Smt. Pratibha Patil’s keen interest on this issue prompted many aggrieved parents, activists, and agencies to come calling on her for advice, help and counsel and also valuable feedback.